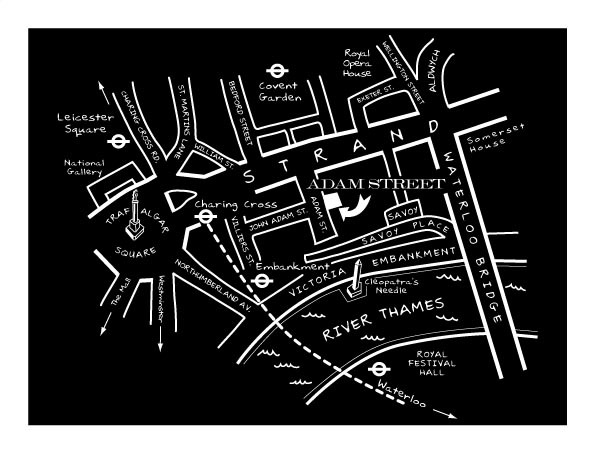 Adam Street Club continuous showings of short films from 6 PM until 11 PM. Fine drink and conversation, come and go anytime thoughout the evening. Detailed directions at the bottom of this page. Peter Cunningham, a noted photographer of entertainers (a list of his subjects runs from Bruce Springsteen to Les Misérables), has developed a personal medium that he calls "still film," in which a series of images are projected onto three screens, accompanied by an original score. These visual poems are decidedly more ambitious than his celebrity work; in the past they've consisted of essays on nature and consumerism. He shot his latest still film in Berlin, and it addresses, in a stunningly colorful fashion, how the walls that hem us in are not necessarily made of concrete. SOUPE DE LA VIE - L'Un Est L'Autre, a soup kitchen in Paris, shops, cooks, and serves. LIFE ON EARTH - Adam and Eve fell from Paradise to Earth, the same one we live on here and now. BLINDERS - Our senses are overwhelmed, our vision is manipulated, and our energy is channelled.
" Well, you go down the Strand until you see where Chicago the musical is and then turn down towards the Thames and it is hidden behind a door (which looks like No. 10 Downing Street) with No.9 on it on your left." all go right past our front door.